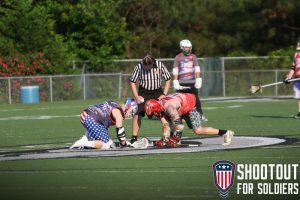 Shootout for Soldiers 2019 will be held in Atlanta on May 18 at Kennesaw Mountain High School. Shootout for Soldiers is a 24 hour lacrosse event benefiting American veterans. The event is not a tournament or about recruiting, rather it is all about supporting those who serve our country. There are 24, 1-hour games in a row and a running score is kept between the two teams, Stars and Stripes. Participating teams play in one 1-hour slot during the event and the event is open to men’s and women’s teams of all ages. The event begins at 4:00 pm on Saturday May 18, and ends at 4:00 pm on Sunday May 19. Help make these games possible for the teams that have raised money to play by donating your time for a game or two in the Shootout for Soldiers. If you are interested in volunteering, please contact Jay Puckett at jaypuckettafa97@gmail.com and provide your preferred times: Saturday, Sunday or Overnight (typically Men’s Club teams).